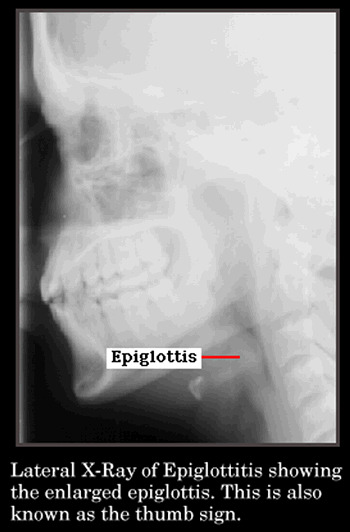 Epiglottitis is an infection of the epiglottis and supraglottic structures. It more precisely should be called acute supraglottitis, because inflammation of the supraglottic structures can cause this constellation of symptoms without actually involving the epiglottis itself. Because of historical considerations, this multimedia textbook will use the term epiglottitis. It characteristically occurs in children ages 2-7 years old and is caused by Haemophilus influenzae type b also known as H. influenzae - (DISCUSSION). Epiglottitis has an abrupt onset of high fever, sore throat and dysphagia, moderate to severe respiratory distress, stridor, and lethargy . These children appear very toxic with flushed skin and often sits leaning forward with mouth open and chin extended in an effort to maintain their airways. The dysphagia does not allow them to clear their oral secretions, and they are often drooling on presentation. The voice is also muffled, called a "hot potato" voice, because it sounds as if the child is talking with a hot potato in his or her mouth. The child may also show intercostal retractions and perioral cyanosis and sounds stridorous (SOUND). These children may be so tired from their work of breathing that they may present with lethargy, fatigue, or even frank respiratory failure (SUMMARY). Diagnosis is often presumptively based on history and observation of the child at a distance! Physical examination should be done expediently and with careful attention so as not to increase the child's anxiety. This is imperative!!! Increased anxiety in the child may lead to reflex laryngospasm, acute airway obstruction, and respiratory arrest. Even minor annoyances to the child such as placement of electrocardiogram or ECG leads, or placement of mist by his or her face may cause the child to cry and possibly obstruct the airway. The child should remain with a trusted caretaker at all times, often in their arms. Close monitoring should be done by observation with emergency equipment readily available (SUMMARY) . Do not attempt direct visualization of the epiglottis in the emergency room or office by depressing the tongue as this may also cause reflex laryngospasm and obstruction, which may lead to respiratory arrest (DISCUSSION). Most hospitals have a predetermined protocol for the management of patients with epiglottitis. It is the physician's responsibility to be aware of this protocol and institute it promptly . Necessary personnel include an anesthesiologist skilled at performing pediatric intubation, an endoscopist in the event of difficult intubation and the need for direct visualization of the airway, and an intensivist to manage the patient postoperatively. If the hospital has inadequate facilities and/or personnel to manage all aspects of the patient's care, it is the physician's responsibility to arrange for prompt and safe transport to an institution with adequate facilities and personnel. From the emergency room, the child is taken by a physician to the operating room along with the child's trusted caretaker, where further evaluation takes place with the skilled personnel and emergency equipment available. If the child shows some atypical signs or symptoms of epiglottitis, a single portable endolateral neck x-ray, with the child in the upright position, may be taken before direct visualization of the epiglottitis is done. Endolateral neck x-rays show classic swelling of the epiglottis on the lateral film. This is also known as the "thumb" sign as it resembles the size and shape of the human thumb . The anteroposterior film is usually unremarkable. If the child shows classic signs and symptoms, direct visualization of the supralaryngeal area is carried out promptly using a laryngoscope or bronchoscope. The patient is anesthetized with an inhalation anesthetic, an intravenous line is started with blood sent to the laboratory for culture and CBC, and the larynx and supraglottic tissues are inspected. The diagnosis is based on the finding of swollen cherry-red supraglottic structures usually including the epiglottis . There is thickening of the aryepiglottic folds and arytenoid cartilages, which form the lateral and posterior aspects of the laryngeal vestibule and actually cause the marked upper airway obstruction in acute epiglottitis. These thickened aryepiglottic folds and arytenoid cartilages cause the "thumb sign" on the x-ray - the swollen epiglottis itself does not. An appropriately sized, uncuffed endotracheal tube is inserted with direct visualization and mechanical ventilation initiated (DISCUSSION). Cultures of the epiglottis and throat should also be taken in the operating room. The child is taken to the intensive care unit where mechanical ventilation is continued . Systemic antibiotics directed against H. influenzae such as ampicillin and chloramphenicol combined or single agents such as ceftriaxone or cefotaxime, should be started as soon as possible. Ventilation is continued and direct visualization of the epiglottis is done on a daily basis until the edema resolves, generally within 24-48 hours. Systemic antibiotics are administered for approximately 2 weeks. Note that respiratory isolation of the patient for the first 24 hours of antibiotic treatment is necessary. The CBC is remarkable for a leukocytosis with a marked left shift but this is not specific. Rapid latex particle agglutination of urine or serum for H. influenzae may confirm the diagnosis before blood or direct epiglottis cultures grow. The physician should also consider doing a lumbar puncture for possible meningitis as this organism is highly invasive. Racemic epinephrine and corticosteroids are not helpful in the treatment of epiglottitis. Control measures for invasive H. influenzae type b are very important since asymptomatic carriage in the nasopharynx of household contacts and possibly day care centers is quite high. 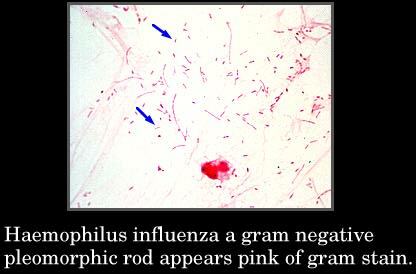 Chemoprophylaxis with rifampin given once daily for 4 days eradicates H. influenzae in approximately 95% of carriers. Rifampin prophylaxis should be given to all household contacts regardless of age where at least one household contact is less than 48 months of age. A nasopharyngeal culture should be done before treatment. Chemoprophylaxis should be instituted as soon as possible after diagnosis of H. influenzae type b is made. Guidelines for the treatment of day care contacts but not definitive recommendations have been set forth by the American Academy of Pediatrics. Vaccination to prevent H. influenzae disease was originally begun in 1985 in the United States for children 24 months or older, but in October 1990 H. influenzae type b conjugate vaccines were approved for children 2 months of age and older. Any children less than 24 months experiencing invasive H. influenzae disease such as epiglottitis should be vaccinated with the standard regimen for age as they might not acquire natural immunity from the infection. If the child is older than 24 months, then the disease itself most likely will cause natural immunity, and immunization is not needed (TABLE). In the future, physicians should expect to see less invasive H. influenzae disease as more children receive adequate immunization. Complications associated with epiglottitis include otitis media, adenitis, meningitis, pericarditis, and pneumonia. Mortality may be as high as 5-10% owing to difficulties in maintaining the airway early in the illness (SUMMARY). The differential diagnosis includes the various members of the croup syndromes especially viral croup and also foreign bodies (TABLE). Note that the epiglottis may be enlarged for other reasons, but these causes do not show the life-threatening clinical syndrome of acute epiglottitis (SUMMARY). 1. Prepare in advance for the management of the disease. 2. Have a high suspicion for the diagnosis. 3. Do not disturb the child until personnel and equipment are available and ready, as reflex laryngospasm and obstruction may occur rapidly. 4. Treat aggressively with supportive measures, antibiotics, and vaccination. 5. Most children have full recovery if treated promptly and aggressively.